Currently all the data are from organizations who are authoritatively managing and publishing the data. Some of these data do included citizen gathered data but it is curated by the government or NGO agencies that requested the information. These data are made available as public, open licensed, and machine readable open formats.”In the future we may provide “citizen contributed” data that abides by these open data principles,” said Turner. 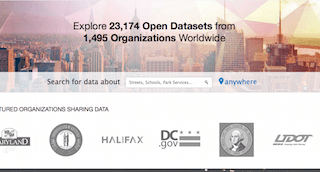 Those who are authorized to add to the Open Data database include any of the hundreds of thousands of governments agencies, businesses, groups and other organizations who use ArcGIS to manage and publish their data. This entry was posted on Wednesday, February 11th, 2015 at 9:35 am. You can follow any responses to this entry through the RSS 2.0 feed. You can leave a response, or trackback from your own site.